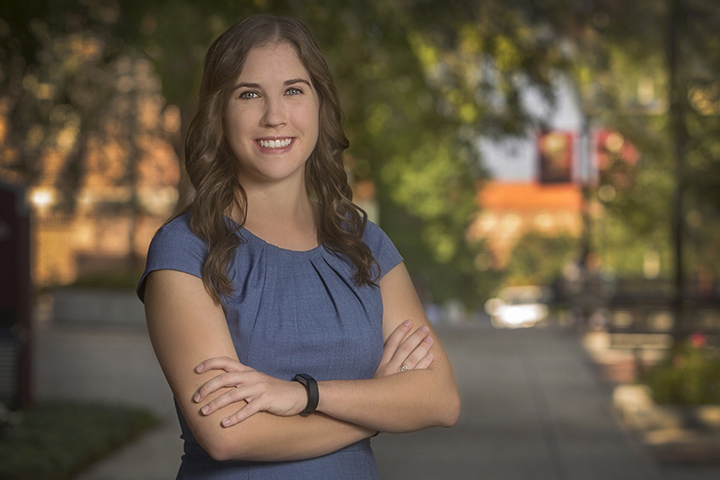 Graduate student Amanda Schell chose to attend Florida State University for simple reasons: its great actuarial science program and an opportunity to play intramural sports with her older brother. But during her four years as an undergraduate, Schell’s schedule was anything but simple. She built an extensive resume as a member of FSU’s first class of Presidential Scholars, along with volunteering, traveling and playing 12 different intramural sports. She soared above and beyond in every aspect of her academic career which began at the International Baccalaureate Program of her high school in Bartow, Fla.
With a double major in statistics and international affairs, Schell always had a full plate. However, no matter how busy her schedule was, she always made time for her other passion — playing sports. Off the field, Schell has always had a love of math. Schell is a co-founder of the Academic Recruitment Organization (ARO), which helps recruit top high school students to FSU. She served as the organization’s logistics chair during its first two years, which involved coordinating outreach to its 100-member body. The group reaches out to more than 5,000 potential high school students annually. At the end of her sophomore year, she was selected as a Class XII member of the Florida Gubernatorial Fellows Program, which immerses students from universities across the state into key areas of state government. In the spring of 2015, she received FSU’s Moellership Service Grant, which enabled her to do a summer of service at Parker Street Ministries (PSM). The award included a $4,000 grant that Schell used to underwrite the conversion of PSM’s donor, volunteer and client records to a new Constituent Relationship Management system. In the summer of 2016, Schell participated in the Charles B. Rangel Summer Enrichment Program in Washington, D.C., where she was exposed to human rights and foreign affairs issues through international crisis management scenarios and cultural competency seminars. During the program, Schell maintained a full course load at Howard University, while engaging in the local culture and forming lasting friendships with other accomplished social science students from across the United States. In the fall of 2016, she was selected by the College of Social Science and Public Policy as a Social Science Scholar and awarded a $5,000 grant to conduct a summer service project in Costa Rica. She also served as the deputy secretary of Student Government Research from 2016 to 2017, where she worked on surveys concerning both campus safety and assisting student-veterans with selecting a major. As a Presidential Scholar, Schell tutored and mentored students at Carter Parramore Academy in Quincy, Fla. She also served as the organization’s inaugural chair in their executive leadership council. “With my background in statistics, I was able to quantify Presidential Scholar impact on campus, in the Tallahassee community and abroad,” Schell said. The Presidential Scholars program also exposed Schell to undergraduate research. She was involved with the Undergraduate Research Opportunity Program (UROP) for two semesters through the College of Business and held another research position for three semesters in the College of Criminology. “Many students do not know research is in every field, not just STEM,” Schell said. While the honors student maintained an exceptional GPA, earning Dean’s and President’s List honors multiple times, she said it was her extracurricular activities that were essential to making her undergraduate experience at Florida State special. Schell is currently at FSU working on a master’s degree in applied statistics. She hopes to have a career in the federal government where she can impact change in public policy.